I haven't painted a French Provincial piece in a while, and when this one came along the other week, I decided it was time to take this classic silhouette and bring it to life with a bright, vibrant shade. I worked with three Annie Sloan chalk paint colors to achieve this look. First I added a bit of Burgundy to Old White to get an extra bold pink. 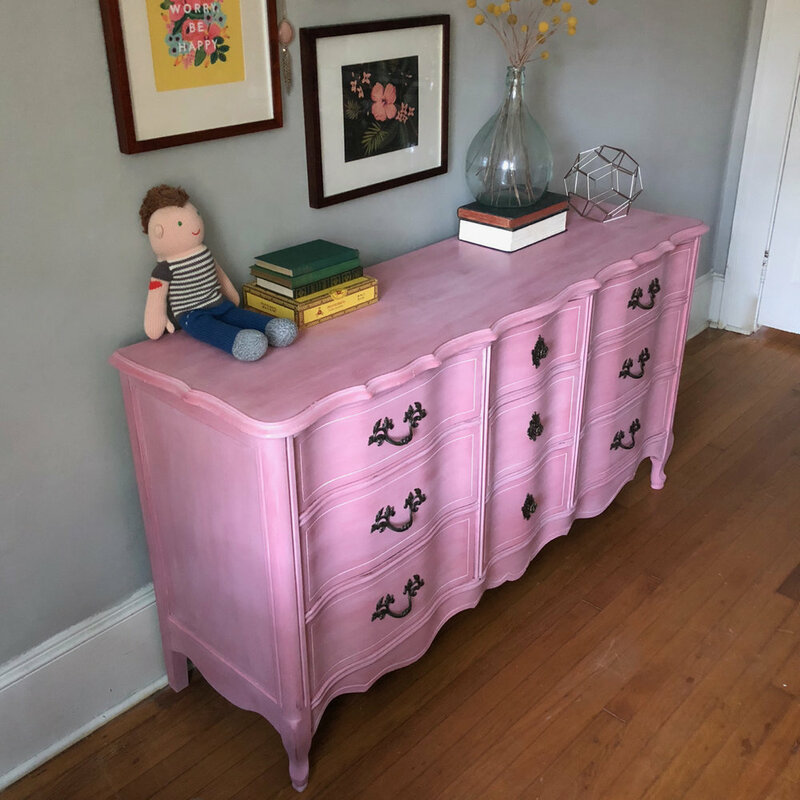 I then took Antoinette, the light blush pink shade I used on my previous pair of nightstands and created a wash. A couple tablespoons of paint plus a approximately a quarter cup of water was all I needed for this piece [and still had more left over!]. The wash takes a bit of practice and a quick hand. For this piece, I brushed the wash on, left it for only a few seconds and wiped it off with a rag. I love using washes. They give the surface of furniture movement and a softness that's hard to achieve with simply paint and distressing. I love how each piece I use this technique with has a unique finish. This piece didn't have a wood grain, and yet the wash gave it a texture that's just beautiful in person. This dresser is now available in my shop! Contact me if you're interested in this piece or have another project I can help you with.